Not even two months ago, we warned iPhone users that the new “WiFi Assist” feature in iOS9 could result in data overages if you weren’t careful. This tale of on San Francisco-area family shows just how bad it can be. 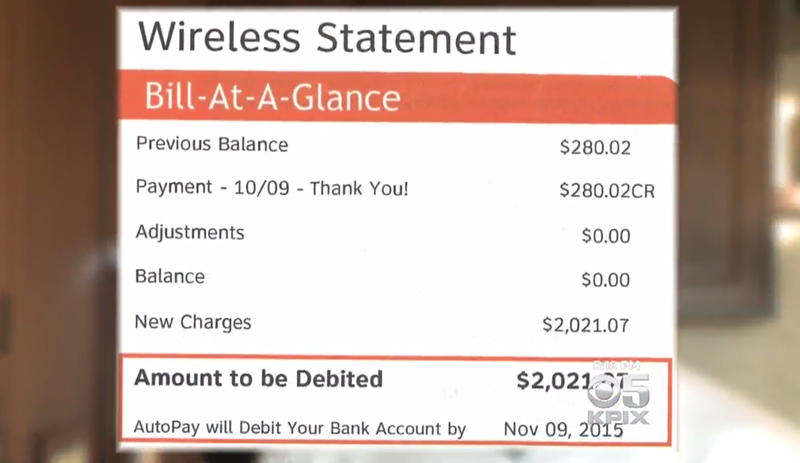 The family admits to CBS5’s ConsumerWatch that their son had received a warning text from AT&T that he was nearing the monthly limit on his data allotment, but says that was nothing new. The son says the text only indicated that he’d reached about 65% of his allowed cellular data usage for the month. What he says he didn’t know was that every time he used his phone in his room, where the home WiFi signal isn’t great, the new WiFi Assist feature — which automatically switches users between cellular and WiFi data to maintain a strong signal — was choosing to use the cell network, resulting in even more data used. Then they received a phone bill from AT&T for more than $2,000, almost ten times the normal amount of the family’s monthly invoice. Like a number of other Apple customers, including some who have filed lawsuits over this feature, the family says they had no idea that WiFi Assist was turned on by default or that it could result in such huge bills. The dad joked that WiFi assists only really assists phone companies in making more money. But not in this case. After being contacted by CBS5, AT&T admitted that the text alert message should have been sent to the primary account holder for the family — in this case, the mom — and has credited their account for the full amount.